Could bendy batteries mean bendy phones? After learning about LG's flexible battery technology last week there's word that its Korean rival Samsung is working on similar things. 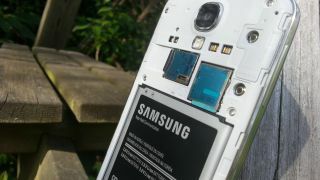 According to Korean site Economic Review, Samsung is working on new battery technology as it looks to curb issues some users have had with their Galaxy handset battery's melting or catching fire. The site claims Samsung is working on flexible versions of its solid state battery which will not only refuse to catch fire, but also allow the manufacturer to fit them into more uniquely shaped devices. Flexible batteries won't guarantee flexible device, but coupled with the bendy screens we're seeing manufacturers churn out - take a look at the Samsung Galaxy Round - it's another step towards the dream of a malleable mobile. Apparently Samsung is aiming to get its flexible battery packs up to the same level as their rigid counterparts by 2015, so it looks like there's still a bit of a wait before we see this in our smartphones and wearable tech. Until then we're just going to have to sit tight and keep our fingers crossed our smartphones don't explode in our pockets.